The Dare Devil Step by the office of the Prime Minister of India to allow 51% FDI in Multi-Brand retail is definitely a positive, but not the panacea for the retail sector facing large hurdles like poor infrastructure, high real estate costs, inefficient supply chain, complex taxation and rigid labour laws. Except for Real Estate. most of them will be addressed with the inflow of foreign capital. Key reforms for retail sector will be implementation of the Model Agricultural Products Marketing Committee (APMC) Act across all states and Goods and Services Tax (GST) which are facing stiff opposition from political parties. What is the Purpose of GST and Model APMC Act ? Model APMC Act was finalised in 2003 with an aim to develop a “barrier-free national market”, but many states are yet to adopt it. GST is likely to remove inefficiencies in logistics and taxations, but some states oppose it. In the light of this development, we present views of METRO Cash & Carry, which was the first company to introduce the concept of Hypermarkets in India. 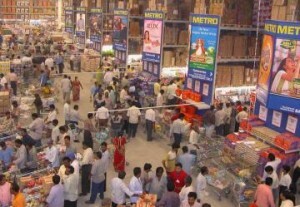 METRO has eight cash & carry stores in India today. They have two stores each in Bangalore, Hyderabad and Mumbai and 1 in Ludhiana, Jaipur, Delhi and Kolkata. 100% FDI in this segment of Wholesale Hypermarkets was allowed since the beginning. Now METRO wants to double the number of stores in one year. METRO had revenues of 200mn Euros in India last year. They have been slow in adding new stores as it took them time to get the right model for India. Key challenges METRO faces in India: Red tape makes doing business in India very difficult, multiple approvals / licenses from various agencies and availability of reasonable priced real estate. Only seven states have implemented the model APMC Act. Initially, they were not allowed to sell fresh foods in their stores. They took the legal route and got a favorable verdict after 5 years of legal process. Even the states that have reformed APMC act are not implementing it due to the vested interests. For example, Karnataka doesn’t allow a private player to set-up a mandi within 25km of an existing mandi, thus protecting the trading community. India is going to have a very slow liberalization and may remain an emerging market for longer time because all other markets would have developed by then.